Arginine alpha-ketoglutarate is a dietary supplement consisting of the amino acid arginine -- a building block of protein -- and alpha-ketoglurate, a compound that breaks down sugars and amino acids. Both constituents of AAKG have different roles and may offer benefits, but more research is needed to know for sure. On rare occasions, taking AAKG may cause side effects, so get your doctor's permission before taking it. AAKG may boost athletic performance, but evidence from large studies is lacking. The journal Nutrition published two small double-blinded studies in its September 2006 issue that showed positive results. The study participants were healthy men between the ages of 30 and 50. 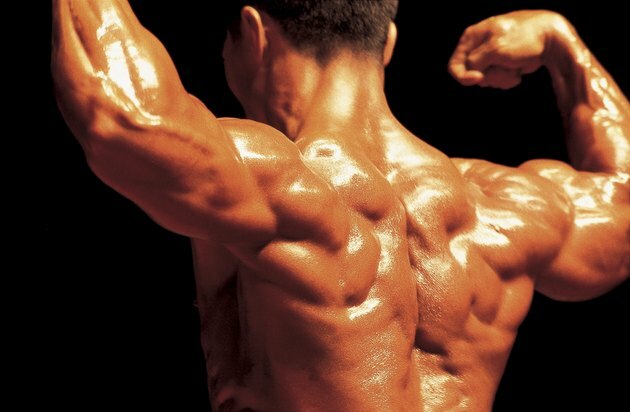 Researchers found that supplementing with AAKG increased arginine levels and beneficially influenced peak power output on wingate and bench press tests. Both of these are anaerobic exercises, which refers to short-duration, high-intensity movements common in nonendurance sports such as bodybuilding and sprinting. AAKG has not been shown to have benefits for endurance exercise. Researchers evaluated the anti-cancer properties of alpha-ketoglutarate and published the results in the May 2012 issue of the Scandinavian Journal of Gastroenterology. The authors explain that previous studies show alpha-ketoglutarate prevents tumor growth in cells that have been deprived of oxygen, a state known as hypoxia. Researchers set out to determine whether it had the same effects in cells that had normal oxygen levels. They found that alpha-ketoglutarate successfully prevented colon cancer from spreading to cells under normal oxygen conditions. However, this study was done in a lab using cultured cancer cells. More research is needed to know whether it offers the same cancer-fighting benefits for people. People take AAKG because arginine increases nitric oxide, a signaling molecule your body produces that causes blood vessels to expand. This property may offer benefits for blood pressure. Researchers conducting a small study found that taking arginine temporarily lowered blood pressure in people with Type 2 diabetes and mild hypertension. The authors suggest the effect is due to arginine increasing the amount of nitric oxide in the blood vessels. The study was published in the October 2002 issue of the Journal of the American College of Nutrition. The study published in the Nutrition journal concluded that AAKG is well-tolerated and reported no serious side effects or abnormalities. However, the journal Human and Experimental Toxicology reported three cases where AAKG is linked to adverse effects requiring hospitalization. The report, published in May 2009, did not state whether high dosages were involved. You may need to avoid taking arginine supplements if you're prone to cold sores, or have genital herpes, as the virus uses arginine to replicate.